Spectacular in structure, the Hyatt Regency Hotel Dallas Fort Worth International Airport is located within the Dallas Fort Worth International Airport premises. The magnificently coordinated combination of guest accommodations, meeting facilities, personal services and other facilities at Hyatt Regency Hotel Dallas Fort Worth International Airport is highly commendable. Hyatt Regency Hotel Dallas Fort Worth International Airport features 811 guest rooms and 92,000 square feet of function space for conventions with a 21,000-square-foot ballroom and 74 separate meeting rooms. Hyatt Regency Hotel Dallas Fort Worth International Airport features the Constellation Hall, which offers 18,050 square feet of flexible hotel space, for large events. Hyatt Regency Hotel Dallas Fort Worth International Airport offers a full-service Business Communication Center, Executive Conference Level featuring high-speed Internet in the Business Plan level office, two hotel restaurants, one lounge, Exercise Room, heated outdoor pool, and complimentary transportation to and from airport terminals and Bear Creek Golf Club. In addition to this, valet parking and complimentary garage parking are available for hotel guests of Hyatt Regency hotel Dallas Fort Worth International Airport. Hyatt Regency Hotel Dallas Fort Worth International Airport provides convenient access to many Dallas attractions such as Dallas County Historical Plaza, Dallas Museum of Art, Dallas Zoo, Dallas World Aquarium and Sixth Floor Museum at Dealey Plaza. 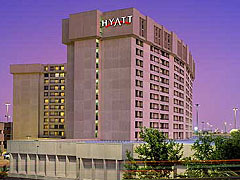 Hyatt Regency Hotel Dallas Fort Worth International Airport features 811 luxurious guest rooms, including 11 suites. Some rooms are equipped with compliant facilities for the handicapped hotel guests, including wheelchair access and telecommunications devices for the hearing impaired. Hyatt Regency Hotel Dallas Fort Worth International Airport provides several dining options for its hotel guests, with four diners and bars offering a mixture of fast foods, bar menu fare, beverages, new American cuisine, seafood and steaks for breakfast, lunch and dinner. Hyatt Regency Hotel Dallas Fort Worth International Airport features 92,000 square feet of function space and 74 separate meeting rooms. Constellation Hall, built in summer 2001, provides even more meeting flexibility. Hyatt Regency Dallas Fort Worth International Airport is the proud recipient of Meetings and Conventions Magazine's 2002 Gold Key Award.